Valentine’s Day 2019 2-for-1 SPECIAL! How about a new Smartphone for your Loved One? If you plan to gift a new Smartphone to your Valentine or to go on a short romantic trip abroad, make sure to take advantage of our Valentine’s Day 2-for-1 SPECIAL! 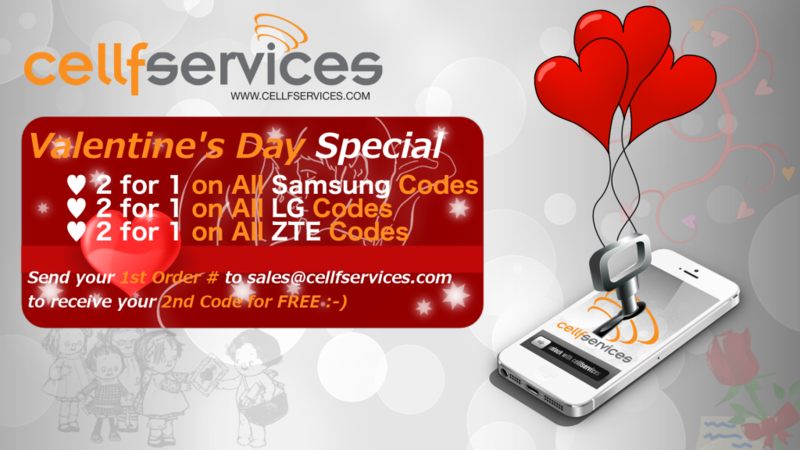 Just order any Samsung, LG or ZTE Unlock Code and get your 2nd one for FREE – Happy Valentine’s Day! The Special is valid 12th-19th of February 2019. All Models of the stated manufacturers are eligible. Use your device with any GSM Network worldwide without restrictions. Say “Good Bye!” to Roaming Fees by simply using local SIM Cards on travel. Increase the value of your phone drastically when selling. With over 10 Years of Experience we provide Unlocking Solutions for more than 10k Phone Models worldwide. Our Services are fast, easy and effective. Let our Experience work for you – Unlock Now! Permanent Unlock – All our Codes unlock your device permanently! 24/7 Fully Automated Order Processing & Delivery by Email. Lowest Price & Fastest Processing Time for all Unlock Codes! No need to send your phone in – Get your Unlock Code fully remotely by Email. No complicated Software or Cables required – Just enter the Unlock Code! No Risks of Damage or Side Effects on the phone’s firmware. No Hidden or Subsequent Costs – All Unlock Codes are a single One-Time Fee! 100% Money Back Guarantee – No charges for wrong codes. Live Support by Toll-Free Hotline, Skype and Email. Get your Unlock Code now! Black Friday & Cyber Monday 2018 SUPER SALE!